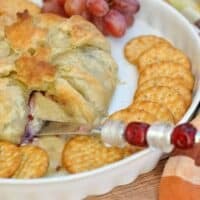 For the perfect Holiday appetizer, consider making this Cranberry Pecan Brie wrapped in Pepperidge Farm® Puff Pastry Sheets! When it comes to the holidays, it’s all about the dinner, right? I mean you slave over your turkey or ham, the lump free gravy, the homemade cranberry sauce, the stuffing, even the desserts! I mean we spend the month of December creating the perfect cookie trays! But if you have a family like mine, you want to nibble on something BEFORE the dinner is ready. Yes? One thing I always keep on hand in my freezer are Pepperidge Farm® Puff Pastry Sheets. 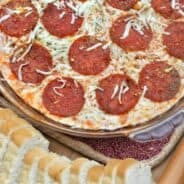 I use them to make quick breadsticks, breakfast struedels, and easy turnovers! 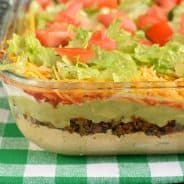 They are perfect for time saving meals, but also delicious too! This year, I have found myself obsessed with Brie Cheese. I can’t seem to eat enough of it. No need for anything but a cracker, and I’m a happy girl. But instead of serving just a chunk of cheese, I wanted to “dress it up” for the holidays. I know many of you LOVE homemade cranberry sauce. You shout from the roof tops that your recipe is the best! You add orange zest or ginger or cardamom, and claim it’s the best. And I trust you. So for this recipe, use your favorite cranberry sauce. I personally happen to like the canned stuff, haha!! I used 1 cup of the Whole Berry Cranberry Sauce. 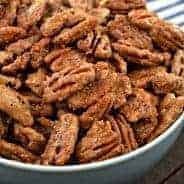 I also added about 1/2 cup of chopped pecans. Just for a little extra flavor! Assembling the appetizer took very little time. But, plan ahead. You need to thaw your puff pastry for about 40 minutes on your counter top! Once thawed, unfold the pastry and place your wheel of Brie cheese in the center. Top it with your cranberry sauce and chopped pecans. Before wrapping the cheese, I used a small “leaf” shaped cookie cutter to cut TWO leaves for garnish. I cut them out of a corner of the Pepperidge Farm® Puff Pastry Sheets. This is totally optional. You can cut a pumpkin, or turkey, or nothing. Take the 4 corner and pinch them up at the top. Now you will have 4 open loops on the sides. Grab each of those and pinch them on top too so there are no openings in your pastry. To help the top look pretty, I placed the two leaves on top of the seams. Bake your pastry and enjoy while the cheese is soft and gooey! 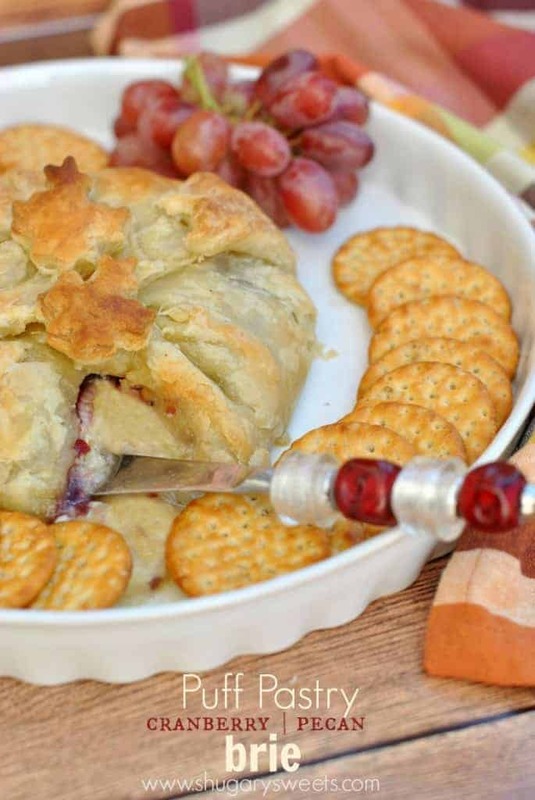 You will love the tart cranberry with the taste of the brie cheese! And the flaky Puff Pastry just makes it all taste better! Thaw Pepperidge Farm® Puff Pastry Sheet according to package directions. 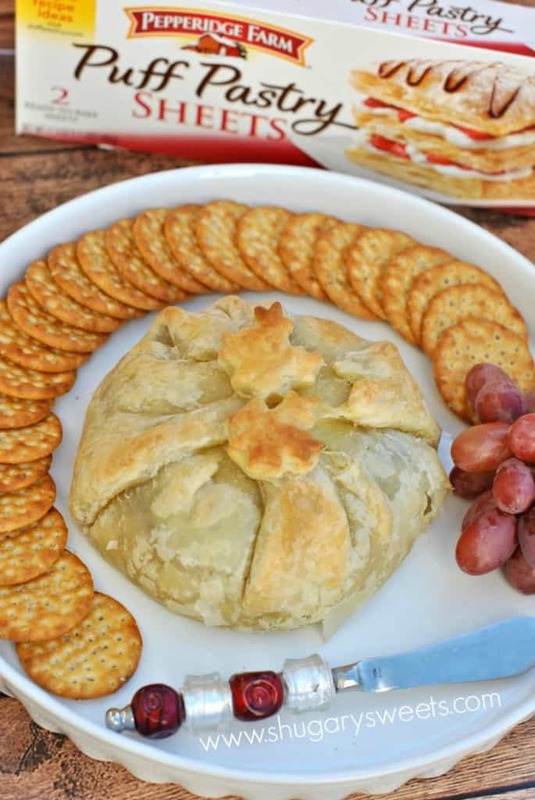 Once thawed, place brie wheel in center of puff pastry. Top with cranberry sauce and pecans. 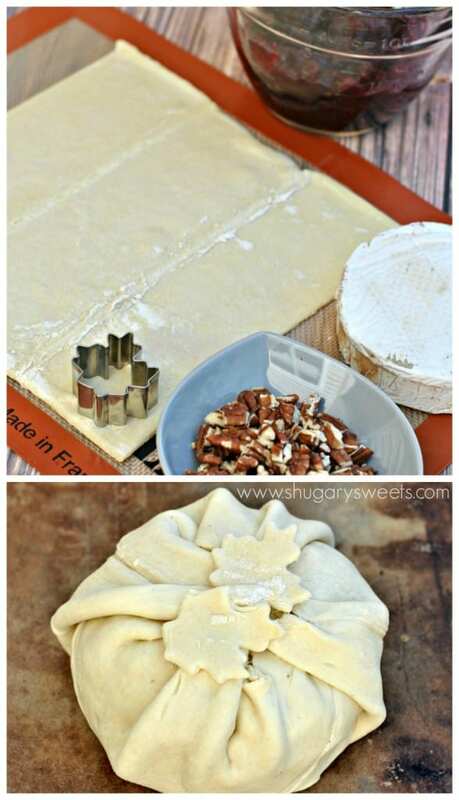 Using a small leaf shaped cookie cutter, cut two leaves out of the corners of the puff pastry. Bring up all four corners of pastry, pinching seams at the top. Bring up loops on sides, pinching the seams at the top. Place two leaf cut outs on top of seams. Bake pastry on a parchment paper lined baking sheet in a preheated 400 degree oven for about 18-20 minutes, until pastry is golden and flaky.